A sea loch to the north of Loch Carron on the coast of Wester Ross, Loch Kishorn opens out into the Inner Sound opposite Skye. It is fed by the River Kishorn. A construction yard for deep-water oil platforms was established here by Howard Doris in 1975 and a village was created for 2,000 workers, known as the Kishorn Commandos. The 600,000-tonne concrete Ninian Central Platform, the world's largest movable structure, was constructed here in 1978. 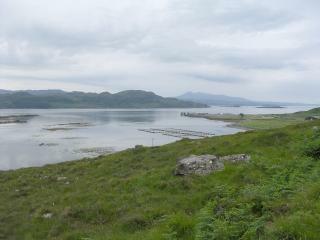 The yard was eventually closed in 1987, but the immense dry-dock remains on the northern shore of the loch and was used to construct components of the Skye Bridge in 1992.